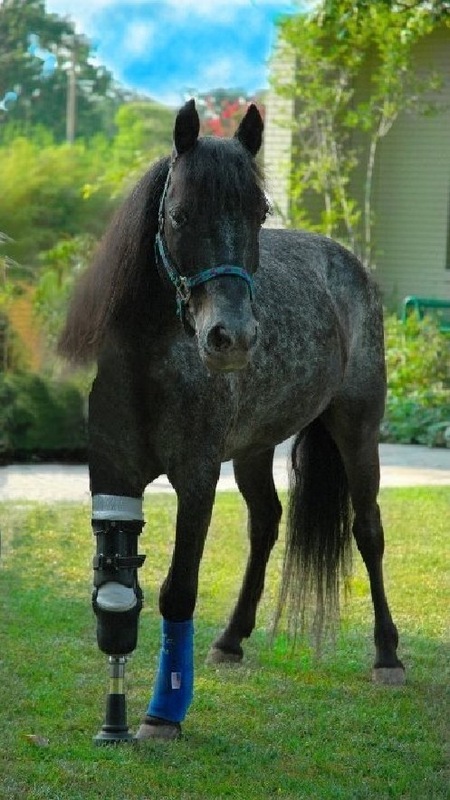 Molly is a gray speckled pony who was abandoned by her owners when Hurricane Katrina hit southern Louisiana. She spent weeks on her own before finally being rescued and taken to a farm where abandoned animals were stockpiled. While there, she was attacked by a dog and almost died. Her gnawed right front leg became infected, and her vet went to LSU for help, but LSU was overwhelmed, and this pony was a welfare case. You know how that goes. But after surgeon Rustin Moore met Molly, he changed his mind. He saw how the pony was careful to lie down on different sides so she didn’t seem to get sores, and how she allowed people to handle her. She protected her injured leg. She constantly shifted her weight and didn’t overload her good leg. She was a smart pony with a serious survival ethic. Moore agreed to remove her leg below the knee, and a temporary artificial limb was built. Molly walked out of the clinic and her story really begins there. “This was the right horse and the right owner,” Moore insists. Molly happened to be a one-in-a-million patient. She’s tough as nails, but sweet, and she was willing to cope with pain. She made it obvious she understood that she was in trouble. The other important factor, according to Moore, is having a truly committed and compliant owner who is dedicated to providing the daily care required over the lifetime of the horse. Molly’s story turns into a parable for life in Post-Katrina Louisiana …….. The little pony gained weight, and her mane finally felt a comb. A human prosthesis designer built her a leg. The prosthetic has given Molly a whole new life, Allison Barca DVM, Molly’s regular vet, reports. And she asks for it. She will put her little limb out, and come to you and let you know that she wants you to put it on. Sometimes she wants you to take it off too. And sometimes, Molly gets away from Barca. “It can be pretty bad when you can’t catch a three-legged horse,” she laughs. Most important of all, Molly has a job now. Kay, the rescue farm owner, started taking Molly to shelters, hospitals, nursing homes, and rehabilitation centers. Anywhere she thought that people needed hope. Wherever Molly went, she showed people her pluck. She inspired people, and she had a good time doing it. This is Molly’s most recent prosthesis. The bottom photo shows the ground surface that she stands on, which has a smiley face embossed in it. 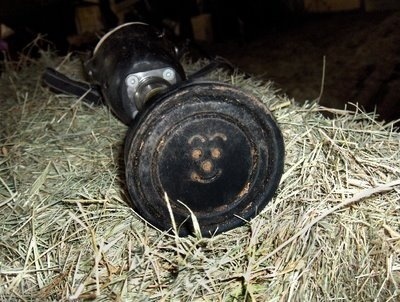 Wherever Molly goes, she leaves a smiley hoof print behind. If you feel like it, forward this and share it with all of the animal lovers that you know. God’s creatures often reflect the character to which we aspire. What are your thoughts about this? — leave a reply below or follow me (@DisneyEcho) on Twitter and leave a comment there!